As a little kid, when I was barely 7 years old, I had seen Mother India with my parents. The most impressive shot that got embedded in my memory was the loss of upper limbs of Shamu (Raaj Kumar). 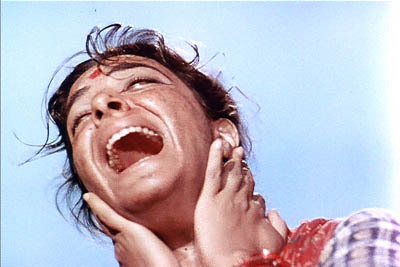 The helplessness that Raaj Kumar portrayed culminated into his subsequent departure from the house leaving his young pregnant wife Radha (Nargis), already a mother of three children and his old mother. Recently I saw this movie again. Isn't marriage ceremony once a lifetime affair? Shamu's mother pledges her land for Rs.500 so that the marriage takes place in a great fanfare. This over-indulgence ultimately becomes the curse for the entire family. When the land is pledged for a loan of Rs.500 the oral deal between Shamu's mother and the money lender Lala is that until the loan is paid, one fourth of the harvest will be paid to Lala towards interest. However, the Lala (small prints phenomenon) writes in his book that three-fourth of the harvest will be paid as interest and the old lady signs the contract with her thumb impression. During the course of the film she protests in the Panchayat that her oral deal was that she would pay one fourth of the harvest towards interest however the elders pass the verdict in favor of Lala who has a "written" contract duly "signed" by Shamu's mother. As with every harvest bulk of the grain goes away as interest there is no scope whatsoever for the repayment of the loan. It is at this juncture that Radha suggests cultivating their rocky piece of barren land on which there is no lien of Lala. Inspite of Shamu's repeated reminders that the land is not ploughable due to heavy rocks, she persists. In this effort one of their precious bullock dies. Catastrophy follows when Shamu's upper limbs are crushed while toiling to move a heavy piece of rock. In this pathetic state Shamu is all but at the mercy of his wife Radha's support. The shot where Radha lights a Bidi for Shamu and helps him smoke, when his children too join in and the young Birju (played by Sajjad Khan) is shown taking a puff or two, Shamu's portrayal of helplessness in stopping his child to smoke is breath-taking. Shamu's self esteem is totally destroyed when Lala places the bullock bells on his neck and tells him that all he can do is beg and disappear rather than depend on the support of his wife. I think Raaj Kumar gave a sterling performance while portraying the suffering, humiliation and his subsequent departure depending more on gestures than dialogs. With the departure of Shamu, it is totally left on Radha to handle the situation. Unlike normal Indian movies where the film ends with reunion of the hero and heroine, Shamu's departure early on in the movie is the end of his role. Yet, Radha gains strength from the faith that he might come back. It is not merely a melodramatic presentation by Director Mehboob but an almost factual rendition when he shows problems after problems including floods and destruction to the harvest. The rural India even today is at the mercy of nature's bounties and fury. In the course of the floods Radha's two children die. Hunger of her children is unbearable and it is at this juncture that Radha the mother overcomes the ideal Radha the woman and agrees to trade her body with Lala for few morsels of food. Eventually, however, the honor, strength, character and womanhood of Radha the woman prevails and she returns back to her hungry children with honor and dignity. Birju and Ramu become adults. While Ramu becomes a docile farmer, Birju eventually becomes a bandit and almost but kills the Lala and tries to abduct his daughter (whom he picks up while she is getting married to someone else). Radha the mother tries to stop Birju as she believes that the daughter of the village is as much like her own daughter. When Birju does not stop, she does not hesitate in shooting him. In revenge meanwhile Lala burns the entire fields knowing fully well that the hurt Birju is hiding in the bundles of Dhan. This shot is almost the climax of the film. Nargis was in her late twenties when this film was made. Portraying a newlywed bubbling Radha to a wrinkled old lady who does not even comb her hair, she carries the film almost entirely on her shoulders with an excellent support of character portrayal by Raaj Kumar as Shamu and Kanhaiya Lal as the money lender Lala. Rajender Kumar, Sunil Dutt, Kumkum, chanchal, Mukri and others lend good support with their roles. The rural backdrop, the songs based on folklore and an overall directorial effort by Mehboob make Mother India the epic movie. While the movie touches upon the various social prevalent ethos, the core idea revolves on the honor and integrity of womanhood. It is a Movie of Epic proportions. Nargis got the role of a lifetime and virtually lived the role. It is not a Movie, whoever has watched the movie becomes one of the characters of the movie. It is an intense experience that one goes through. One of the all time great movies that Bollywood has churned out. I am hardly able to believe that Bollywood made such movies considering the state of the Movies churned out nowdays. I dont how many times I have seen this movie. Each potion is like my own palm. The song by Birju "na me bhagwan hoon na me shaitan hoon" is an unforgettable song. In any case Nargis is towering the whole movie. Yes, I am going to see this movie again just now.